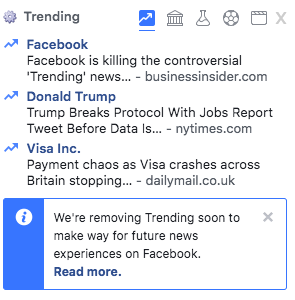 We’re removing Trending soon to make way for future news experiences on Facebook. We introduced Trending in 2014 as a way to help people discover news topics that were popular across the Facebook community. However, it was only available in five countries and accounted for less than 1.5% of clicks to news publishers on average. From research we found that over time people found the product to be less and less useful. We will remove Trending from Facebook next week and we will also remove products and third-party partner integrations that rely on the Trends API. So it seems trending has a week left of life. According to the same Facebook Newsroom post, they are currently testing with 80 publishers across North and South America, Europe, India, and Australia a way to put BREAKING NEWS indicators on their News Feed posts, and test the ability for the publishers to send notifications of BREAKING NEWS. In addition to those tests, Facebook is also looking at adding a new dedicated section, that I assume would fit on the left side of Facebook, possibly under Explore? I’m assuming on the location, under Explore, for this new dedicated section as the 3rd thing that Facebook lists on the News Room post is (For the US only) a dedicated section within Facebook Watch where people can view live coverage, daily news briefings, and weekly deep dives. The last part of that, the weekly deep dives would be “Exclusive to Facebook Watch”, per the post. Considering the controversy of Facebook news being used to effect the 2016 US Presidential campaign, and all of the baggage that still hangs over Facebook from that, it’s surprising it is taking this long for these changes to happen.